This post, however, will focus on what appears to be the most recently published multilingual African phrase book, Lonely Planet's 2013 Africa Phrasebook & Dictionary (2nd edition), with particular attention to Hausa, Wolof, and Yoruba, which are normally written in extended Latin alphabets. Lonely Planet's publication covers 13 languages, and a slightly different selection than Berlitz: Afrikaans, Amharic, Arabic, French, Hausa, Malagasy, Portuguese, Shona, Swahili, Wolof, Xhosa, Yoruba, and Zulu.5 It is apparently in revision for a new edition due out in mid-2018. Such extended Latin characters and diacritics presented problems on older computer systems because of limitations on font encoding, but since Unicode became standard some years ago, these characters (and non-Latin scripts) are readily displayed. Nevertheless, some publishers and webmasters don't seem to have completely caught up. Lonely Planet seems like an example. The extended Latin script of Yoruba, including subdots and tone marks, appears to be all correct, and they seem to have had no problem with the more difficult non-Latin scripts for Arabic and Amharic. But Hausa and Wolof do not fully conform with standard usage in the countries where they are most spoken (Nigeria and Senegal, respectively, although both are cross-border languages spoken in other countries). In these cases, Lonely Planet may have repeated non-standard usage by earlier Berlitz publications (checking). A company publishing phrase books will follow a set format, which facilitates readers finding the right information in different languages - whether these are in separate books, or sections of one book as in this case. 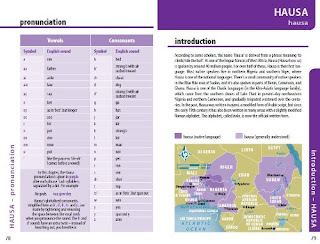 In its Africa Phrasebook, Lonely Planet introduces the pronunciation for a language in a page at the beginning of the section on it (as in the image on the left from the Hausa section). From what I can tell, the orthographies used for most of the languages in the book are correct. Again I am focusing here on three languages written with extended Latin orthographies that have been and sometimes still are mishandled in print and on the web. Hausa's consonant system includes some sounds (implosive b & d, and ejective k & y) that are not conveyed by the traditional Latin alphabet. In the standard Latin-based "Boko" orthography, these are denoted by "hooked" consonants - ɓ, ɗ, and ƙ - plus either 'y (in Nigeria) or ƴ (in Niger). There is also a strong ʦ sound that is represented by the digraph ts (much like the sh digraph represents a sound familiar to English speakers). 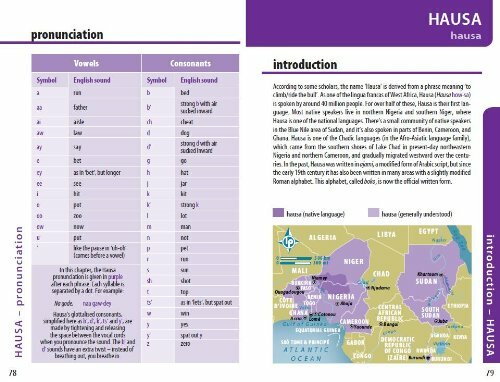 In its presentation of Hausa, Lonely Planet uses letter combinations with apostrophes in its pronunciation guide to denote these 4 consonants, and the ts digraph. However it also uses these rather than the Boko hooked consonants in the Hausa text. (As a rule the pronunciation guide includes word/phrase in the language, how to pronounce the word/phrase, and the English meaning.) 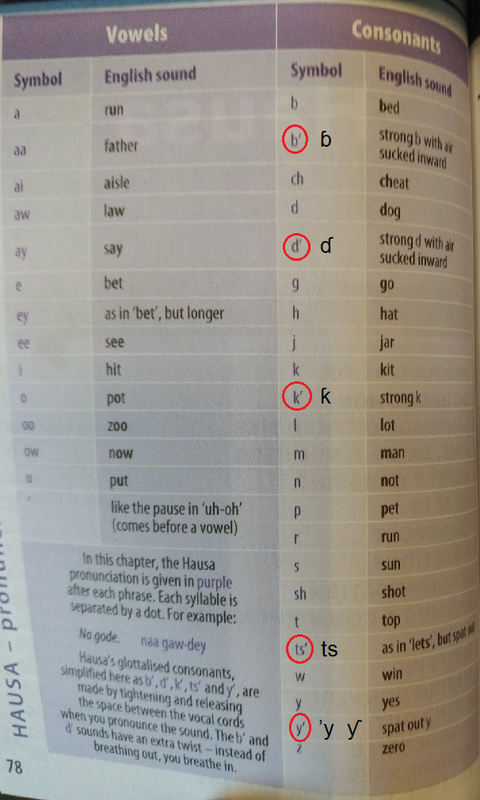 In the blow closer look at the pronunciation page for Hausa I have circled in red their symbols and added the standard characters after (the 'y and ƴ are alternatives, as indicated above). There is certainly no technical reason today not to use the hooked consonants in Hausa text. Using apostrophes is the same workaround for Hausa found in earlier Berlitz phrase books (not clear if there is a connection). But even in pre-Unicode days, typesetters had ways to include modified letters in text (see also the below comments about Yoruba in this same phrasebook). The hooked letters are distinct even in small print, though more so in some typefaces than others. Points in its favor: Lonely Planet does appear to use the correct Boko orthography apart from the apostrophied characters; and the latter are better than the "ASCIIfied" approach commented on previously in this blog (a topic to be revisited later). With one exception, Lonely Planet's Africa Phrasebook seems to use the correct Wolof orthography alongside its own pronunciation system. That is indicating the velar n with ng rather than ŋ (the letter "eng"). 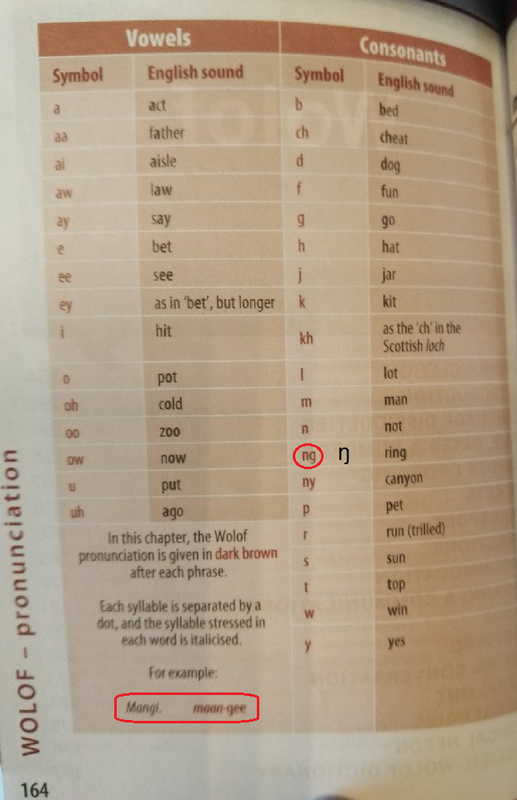 Part of the problem in using the ng in this way is that this digraph also is pronounced as two letters in quick sequence - technically a "prenasalized" g (basically like the ng in mango in English, or in the Wolof example mangi that I circled in red on the pronunciation page above). The whole reason for the ŋ letter was to accommodate the "velar" n (ng as in ring) as distinguished from the n+g combination. In Wolof, as in many West African languages (but not Hausa or Yoruba), ng and ŋ are not the same, so it is not helpful for a phrase book to avoid the distinction. For example, in the glossary includes a Wolof word spelled as ngemb (diaper, nappy). The pronunciation guide uses the same spelling, so one is left to determine if that is meant to be "n-gemb" or "ŋemb." For an English speaker, the velar n in initial position is unfamiliar, and because Lonely Planet doesn't avail itself of the Wolof ŋ to disambiguate pronunciation in such situations, the user is left to guess. Although the letter ŋ is also new to most users, it is easily explained and then becomes a new tool in understanding this small but not unimportant part of Wolof phonetics. For info: The only review I found on Lonely Planet's Africa Phrasebook was a short one on the Wolof section of the first edition, in the Janga Wolof blog. One of the most complex Latin orthographies in Africa is that of Yoruba. The writing system dating back to Samuel Ajayi Crowther uses marks below three letters - ẹ, ọ, and ṣ - to distinguish open and closed e and o, and s from sh. The classic form of the marks is a small vertical line, but these days commonly a dot under or "subdot" is used (also in Igbo and some other languages of southern Nigeria). And as a tonal language, it also features tonal marks over vowels. In African Languages in a Digital Age, I called this a "category 4" Latin orthography - the most complex - since it uses extended Latin characters plus additional diacritics (in the same classification system, the standard orthographies of Hausa and Wolof are "category 3"). 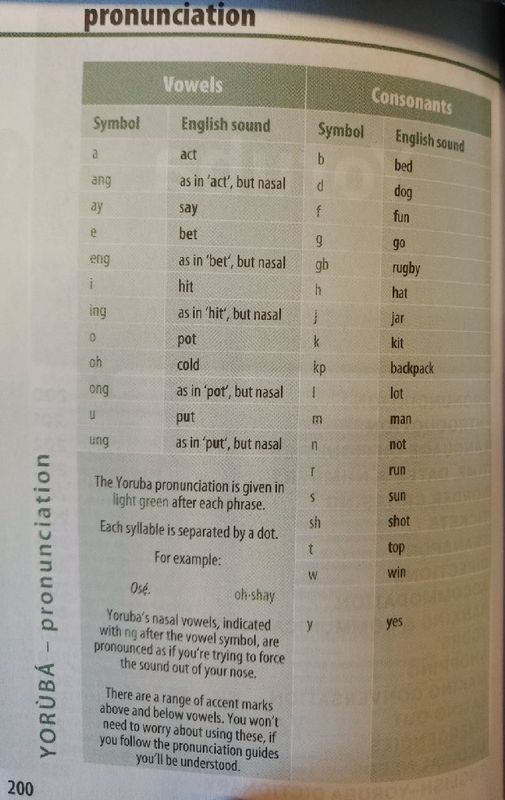 In this section, Lonely Planet has on the one hand given words and phrases in what appears to be the correct Yoruba orthography, including subdot characters and tone marks, and on the other hand used their own system to explain pronunciation (per the page pictured below). Their bridge between the two is to tell users "not to worry" about the "range of accent marks" above and below the letters. As a practical approach, this works for the intended audience and purpose. As in the Amharic and Arabic sections, most readers will not make use of text in a scripts they don't read, but having it makes it available for learning, and also for the eventuality one needs to show the text to a person one is trying to communicate with in the other language. I wasn't sure what to expect before looking at these three sections. In the Hausa and Wolof sections I saw somewhat familiar problems - shortcuts on special characters within otherwise solid efforts. These may have been the result of lack of information, but that wouldn't be much excuse given how much is out on the web and in print on and in these languages. Indeed, Lonely Planet's success (as it looks to me) with the Yoruba section of its phrasebook - not to mention its presentation of two sections in the more complex scripts used for Amharic and Arabic - shows that they should have no trouble with other complex writing systems. Or it could have been a determination that some details of orthographies involving modified letters were somehow unimportant - an attitude I've encountered with regard to African languages in other circumstances (which brings to mind a previous post on this blog about how scholars treat "official orthographies"). This would be problematic and ultimately self-defeating. There are only up sides to using the official standard orthography for a language especially if you are also providing pronunciation guides. 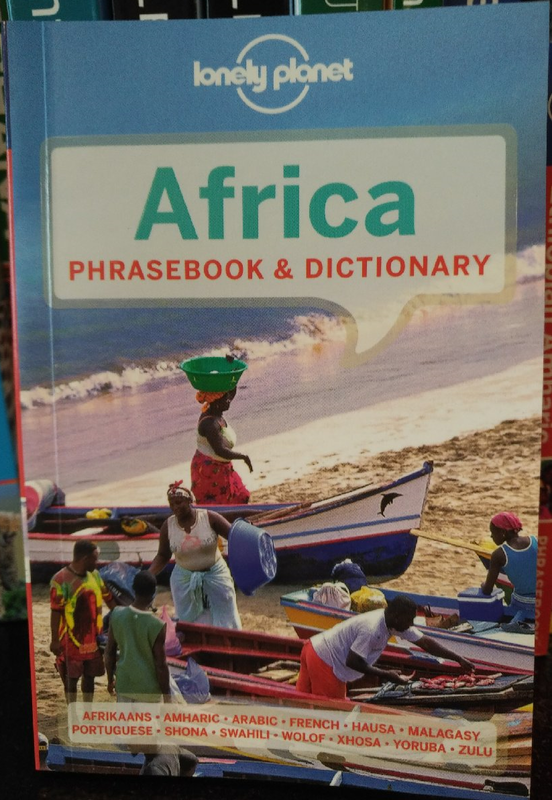 Hopefully the next edition of Lonely Planet's Africa Phrasebook will do for extended Latin in Hausa and Wolof what the current edition did for Yoruba. 1. Alem Eshetu, Amharic for Foreign Beginners, of which there are several editions - latest seems to be 6th ed., 2007. 2. Tim Hentschel, Bambara für Mali - Wort für Wort, Reise Know How, Bielefeld, 2009. The Bambara text in this book is in the official Latin orthography. 3. Pathé Diagne, ed. Manuel de conversation - Wolof/Francais/English, Mandeng/Francais/English, Pulaar/Francais/English - Conversation hand-book, Sankoré, Dakar, 1978. 4. There are at least two editions of the Berlitz phrasebook. In addition to the 1996 publication, another edition came out in 2005. 5. The first edition was published in 2007. It apparently had the same 13 languages covered in the second edition. 6. That's admittedly a bit of an oversimplification.